What a great way to remember a wonderful day at the beach! 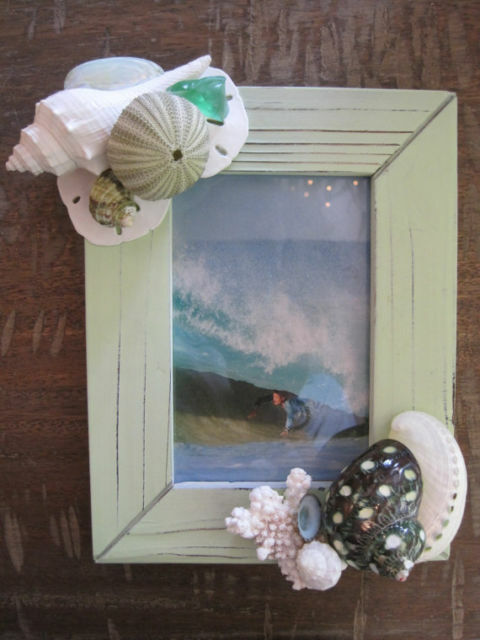 I took a simple wood frame and painted it a soft green color (so beachy! ), then shabbied it so some natural grain shows through. I then added some white mini sand dollars, a green urchin, a spindle shell, a dyed green clam, some green seaglass, a piece of coral, a white abalone shell, and a stunning green and white spotted turbo as a perfect accent! I finished off with some limpets, white conch and a green turbo. This piece has a wonderful natural feel to it. It measures 9 X 6 1/2, with a picture opening of approx. 3 1/2 X 5 1/2. Use this piece to brighten up any room and bring a little bit of a coastal beauty into your home! Makes a great gift for any beach lover too!